Sometimes I feel like that guy in the SciFi movie that is the only one left on earth, surrounded by Zombies. Oh, but I do exaggerate. But as I get older, I am often taken aback by the sheer ignorance of younger people. Of course, that's why teachers teach, isn't it? To hand the baton to a younger generation? To clue them into enduring values, or some such? Of course, it's important for a young soprano to know that Joan Sutherland actually lived and breathed. But what about all the subtle stuff concerning singing and craft? What is happening to all that, that is, all the stuff that no one writes about anymore, or even seems to be paying attention to—which older voice teachers spent their whole careers thinking about? Were they mad? Silly? Stupid? Not as smart as we suppose ourselves to be with our graphs and scopes? We pat ourselves on the back, thinking we've come so damn far. But I wonder about that. Sure, we know more, that is: we have stacks upon stacks of facts. But are we actually able to translate all that knowledge into singers on the stage? I wonder about that when I ponder the oft-heard criticism regarding the homogeneous quality of singing today. Is our knowledge of stuff getting in the way of doing stuff? Here's the thing: I wonder if we go for the small, forgetting that the big has to come first. No, I am not going to get all spiritual on you, though they wouldn't be a bad way to go. Nor am I going to yammer about the global activity of breathing, though that would not be inappropriate considering that it is the fulcrum by which everything related to singing takes place. No. Instead, I am going to write about the tongue, which former pedagogues have written about as being a big deal; the unruly member with a mind of its own: hard to discipline and the strongest muscle in the body. My teacher taught that the tongue had to flow forward. She also taught that its base had to stay down. Sure, these things sound fine on paper, but just try doing them. Same thing with that page in García's treatise where he talks about separating the pillars of the fauces. Hello! Most people don't have the vaguest idea what the word means. Fauces? You mean the gold-plated thing rich people have? But where was I? Oh yes. The tongue. There was an enterprising vocal pedagogue from Chicago named Eugene Feuchtinger who founded an organization called the Perfect Voice Institute in the 1920's, and wrote quite a few books, among them one titled: A Manual for the Study of the Human Voice: Exercises and Practices for Singing and Speaking (1918). 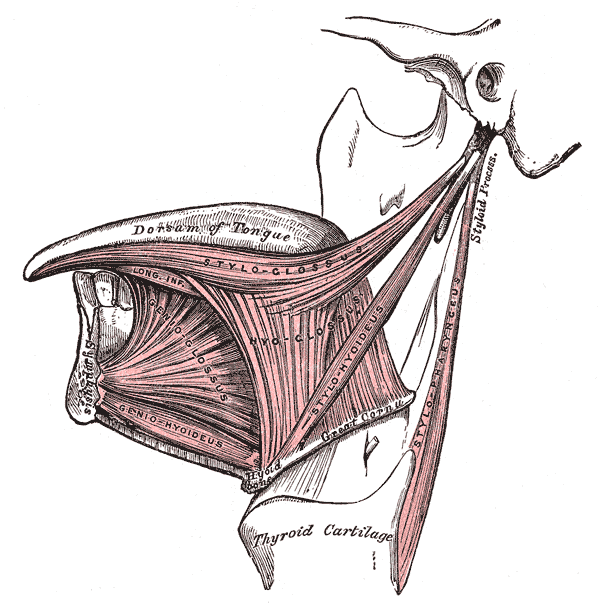 His vocal philosophy was tied to the idea that great singing had everything to do with the activity of the tongue, especially the action of the hyo-glossus muscle. This all came to mind today during a student's lesson, who, unbidden, said the exact words that my teacher used to say, which were: "The tongue flows forward." Well.. indeed it does when one is singing classically. What was I having my student do? Sing a one note exercise on /i/, /e/ and /a/, and back again. To get it right, she heard and felt that she had to let the base of her tongue keep its /i/-ness while migrating through the other vowels. Simple enough, right? You'd think so, but it is never so simple, since the matter has to be heard and felt first to be understood. Writing it out here, in grey and white pixels blurs thing even further; though, in my mind, it brought to mind Mr. Feuchtinger and the roaring 20's: his book—which I have in my library—along with the tongue depressor that came with it.